This week's Western is Oklahoma! (1955) starring Shirley Jones and Gordon MacRae. The old Hollywood Western and the old Hollywood musical don't seem to be a likely combination, but the two genres worked well together in quite a few films. There's the long tradition of the singing cowboy as embodied by Gene Autry and Roy Rogers, and a few classic musicals (The Harvey Girls, Seven Brides for Seven Brothers) that we'll cover later in this series. 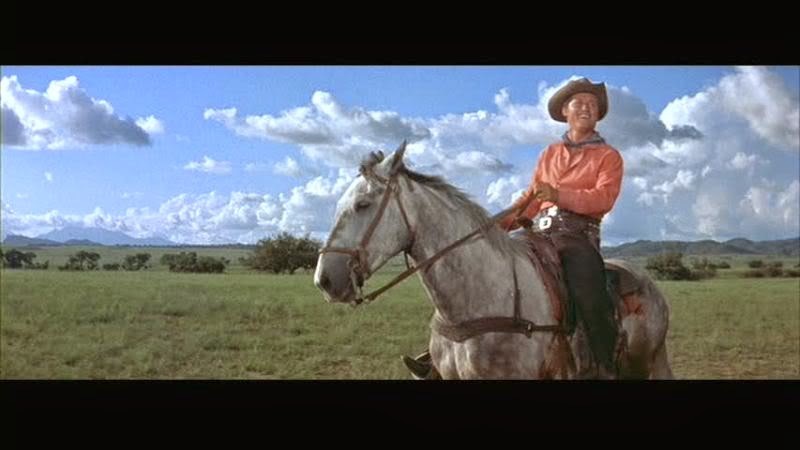 Cowboy Curly (Gordon MacRae) surveys the landscape while belting out Oh, What a Beautiful Mornin' in Oklahoma! (1955). Oklahoma! (1955) is a Western and a musical, but it is far different than the examples I cited in the opening paragraph. This is largely because Oklahoma! is a Pulitzer-Prize winning collaboration between composer Richard Rodgers and lyricist Oscar Hammerstein II and a landmark in the development of the Broadway musical. By the time Oklahoma! made it to the big screen in 1955, it had been on the stage for 11 years and had already been enshrined as the first fully integrated musical in the American theater, meaning that the songs and dance routines helped tell the story and propel the plot forward. Rod Steiger and Shirley Jones in a publicity still for Oklahoma! (1955). Oklahoma! began rather inauspiciously for the great American musical. It started life as a moderately successful 1931 Broadway play called Green Grow the Lilacs that starred the urbane Franchot Tone as Curly. Rodgers and Hammerstein and choreographer Agnes de Mille transformed the simple story into a timeless work of art that featured a dream ballet sequence and some of Rodgers and Hammerstein's most memorable songs, including Oh, What a Beautiful Mornin' and the beautiful love ballad, People Will Say We're in Love (clip below). Oklahoma! 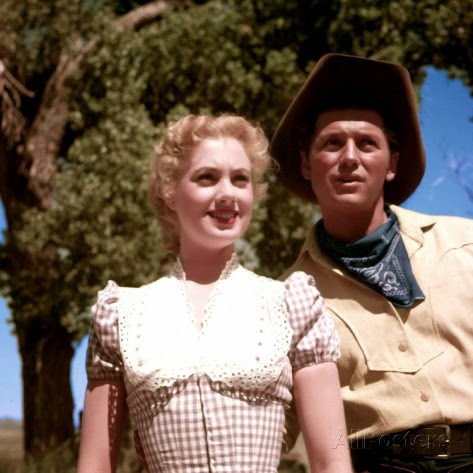 the film, directed by Fred Zinneman, is basically an exact replica of Oklahoma! the stage play and that is both the film's greatest strength and its greatest weakness. Oklahoma! tells the simple story of Laurey (Shirley Jones), a pioneer girl who must decide whether to go to a party with genial cowboy, Curly (Gordon MacRae) or menacing farmhand, Jud (Rod Steiger). 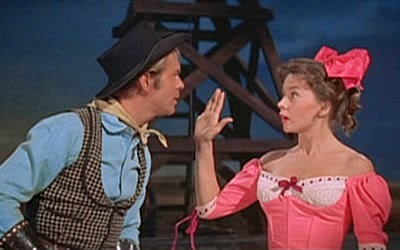 Gene Nelson as Will Parker and Gloria Grahame as Ado Annie in Oklahoma! (1955). Oh, What a Beautiful Mornin' is a rousing opening number largely because the sweeping vistas look so breathtaking in the widescreen photography. From that point on, Oklahoma! settles into a kind of dull respectability with some numbers working spectacularly (Pore Jud is Daid mostly because of Steiger, who is so amazing its like he's in a completely different movie) while others drag on way too long (the seemingly never-ending dream ballet sequence). Oklahoma is slavishly faithful to the stage version largely because Rodgers and Hammerstein were producers on the film. They insisted that excellent singers be cast in the lead roles, which worked out well with Shirley Jones, but they did turn down both James Dean and Paul Newman for Curly. Oklahoma! was only a modest success and Rodgers and Hammerstein were more flexible in other screen adaptations of their work. They cast non-singers in lead roles (both Deborah Kerr in The King and I and Christopher Plummer in The Sound of Music were dubbed) and they were more willing to alter their musicals for the big screen. Oklahoma is available on DVD and video on demand. Next up is the 1931 Best Picture Oscar winner, Cimarron.